Crafty Cakewagon!! : Two Salads For The Price Of One! Two Salads For The Price Of One! Today I was making myself a salad for lunch, and I had some leftover chopped green beans. I thought to myself, "What if I made a salad for tomorrow right now?" 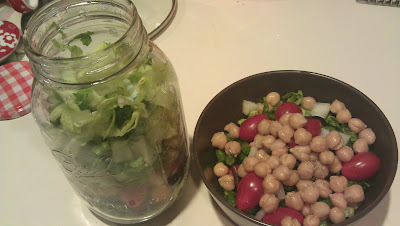 In a mason jar, add some veggies. I used: chopped carrots, cherry tomatoes, chopped green beans, a little bit of raw onion, garbanzo beans, and then lettuce on the top. Here is a secret though; I chopped up the lettuce, like a lot. So much that it's not leafy, and can actually fit on your fork without slurping dressing everywhere (yes, that's a thing). Tomorrow, I'll add some avocado, dressing, and sunflower seeds- and half my lunch is already made!! I know that some people will make these up on the weekend, enough for one every day- but I don't entirely trust that it will still be tasty by Friday. If tomorrow's turns out to be delicious, then maybe I'll try it again with two days' worth!